Asparagus and egg pair well together – especially in the spring. In this hearty salad, they team up with black lentils. These shiny pellets are nicknamed Beluga lentils because of their resemblance to caviar. Black lentils remain firm when cooked, which makes them a great addition to salads, and their inky dark color provides vivid contrast to bright vegetables. Like brown or green lentils, black lentils are a superb source of iron, fiber, protein, folate and magnesium. Plus, they are easy on the wallet. Not bad for a little legume. 1. Rinse and sift through the lentils for any small stones. Put the lentils in a large saucepan and cover with water by about 2 inches. Bring to a boil over high heat and reduce the heat to medium-low. Partially cover the pan and simmer until the lentils are tender but firm, about 25 minutes. Drain the lentils and rinse under cold water to cool. Transfer to a large bowl. 2. While the lentils are cooking, bring a wide pot of salted water to a rolling boil. Add the asparagus and blanch until they are bright green and crisp-tender, no more than 1 minute. Drain and rinse the asparagus under cold water to stop the cooking process. Cut off and reserve the tips and cut the stalks into 1/2-inch pieces. 3. Whisk the garlic, oil, vinegar, lemon juice, mustard, salt, and black pepper in a small bowl. Pour over the lentils and stir to coat. Add the asparagus tips and stalks, the greens, spring onions, jalapeño, parsley, and mint. Gently stir to combine and taste for seasoning – you might need more salt. If the salad is too dry at this point, drizzle with a little extra oil or a squeeze of lemon. 4. Transfer the salad to a platter or divide among serving plates. Alternatively, arrange over a pile of greens. Garnish with the crumbled egg yolks and black pepper and serve. 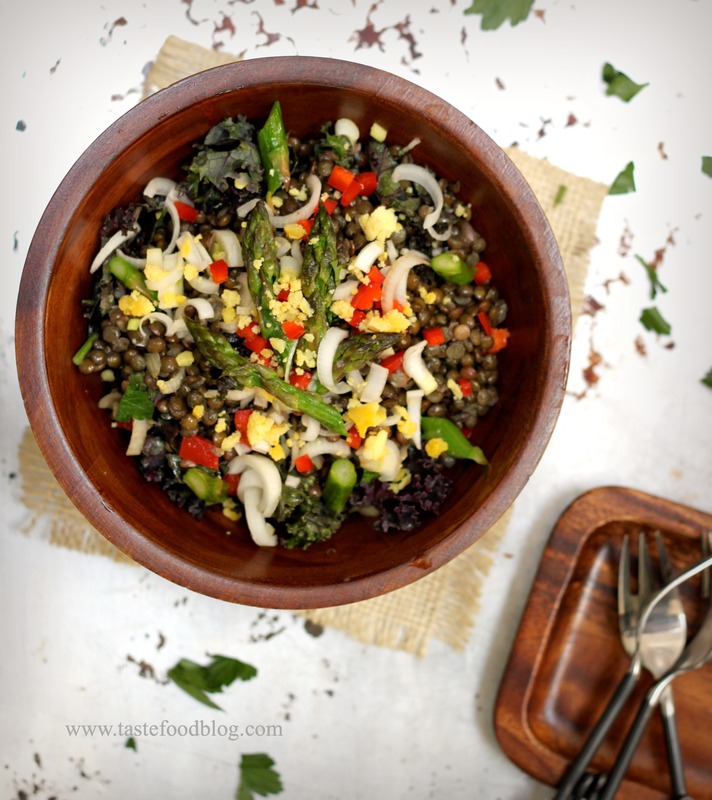 Black lentils are the star of this salad. These tiny pellets are nicknamed Beluga lentils since they resemble caviar. They remain firm when cooked, which makes them a great addition to salads, and their shiny blackness provides vivid contrast to colorful vegetables. 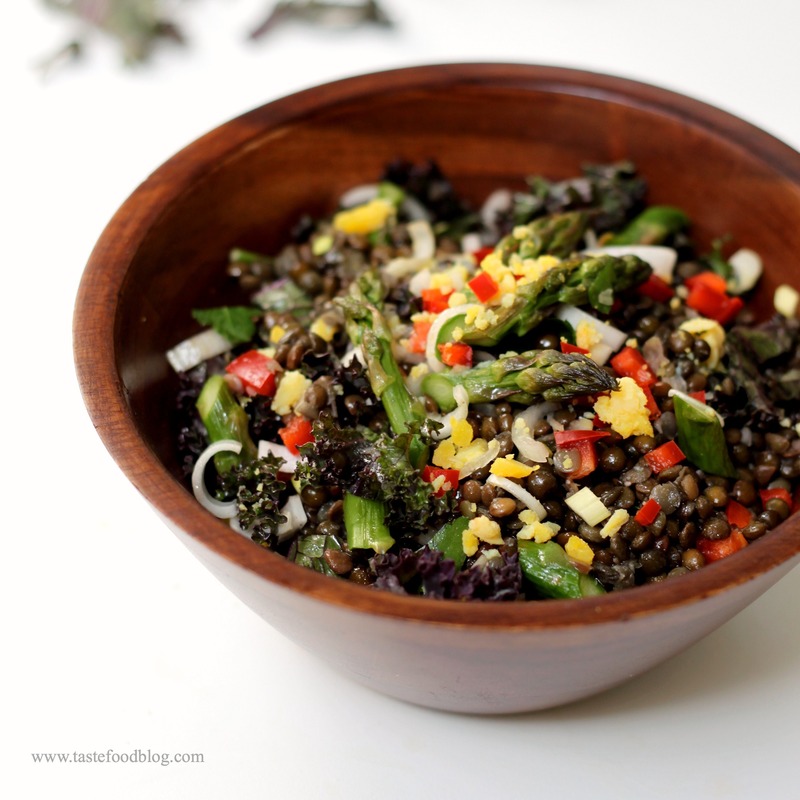 Like their brown or green brethren, black lentils are a superb source of iron, fiber, protein, folate and magnesium. Plus, they are easy on the wallet. Not bad for a little legume. These patties are a cross between falafel and keftas. They are a terrific vegetarian meal or appetizer. We dipped them in a spicy yogurt sauce, but you can also stuff them in pita pockets with a spoonful of sauce and a handful of fresh mint or cilantro. Place the lentils and bulgur in a medium bowl. Ad the olive oil and lemon juice and stir to combine. Cover and let stand at room temperature until liquid is absorbed and bulgur is tender, about 15 minutes. Transfer to a food processor and add the remaining falafel ingredients. Pulse to form a chunky paste. With wet hands lightly form the lentils in 1 1/2-inch patties about 1/2-inch thick. The mixture will be sticky and you will need to rinse your hands between batches. Heat 2 tablespoons vegetable oil in a large cast iron or heavy bottomed skillet over medium-high heat. Add the patties in batches without overcrowding. Cook until golden brown and heated through, turning once with a spatula. Transfer to a plate lined with a paper towel. Repeat with remaining patties. Whisk the sauce ingredients in a small bowl. Serve falafel with sauce on the side for dipping. 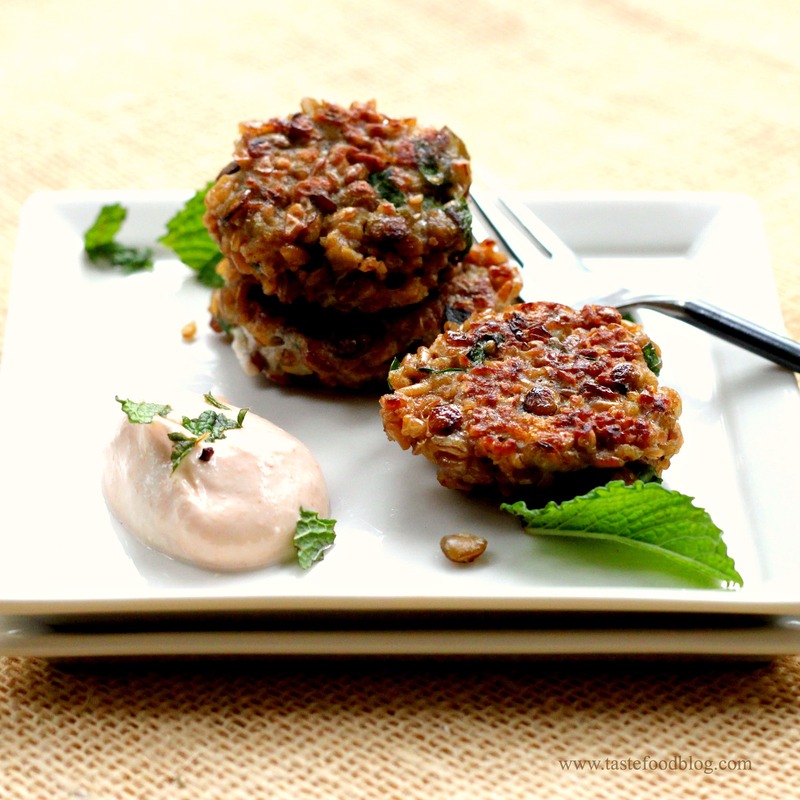 Or stuff 1 to 2 patties in mini-pita pockets, then add a spoonful of sauce and fresh mint leaves. Tip: For completely different rendition, don’t process in the food processor. Simply dump the mixture in a skillet with a little olive oil and saute over medium-high heat until hot and slightly crispy. Serve as an alternative to rice or pilaf. Just because it’s winter doesn’t mean you can’t eat your salad. After all, we adapt our wardrobe for the cold season, and we can do the same with our vegetables. Fresh winter salads, fortified with grains and legumes, heartily provide us with a plateful of immunity-boosting accessories to keep the the doctor away. 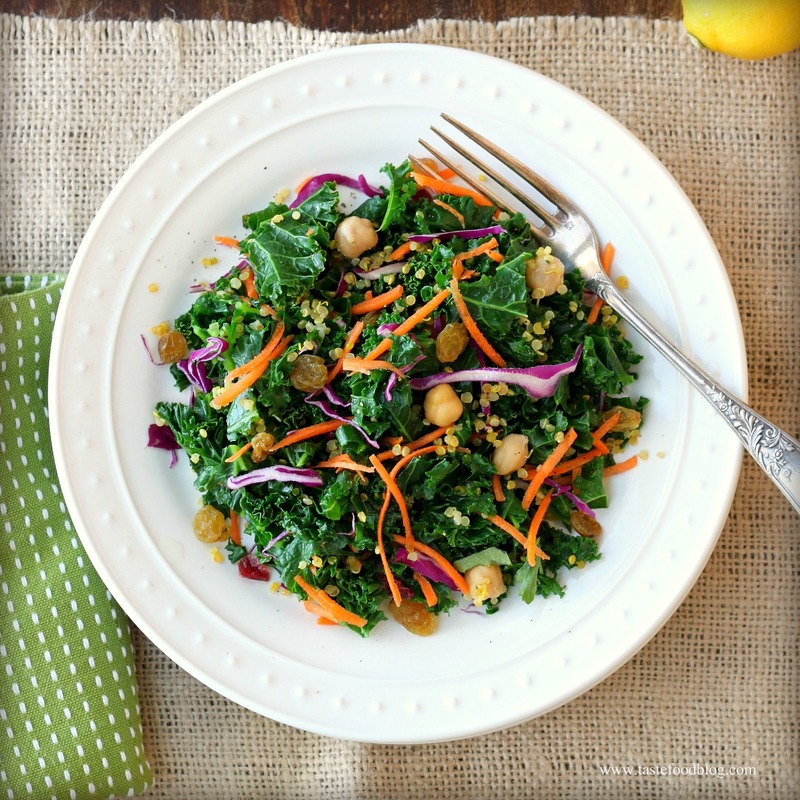 This kale and quinoa salad is packed with healthy ingredients rich in nutrients, anti-oxidants and protein. Kale is a superfood, rich in vitamins A, C and K, high in fiber and the plant form of omega-3 fatty acids as well as cancer fighting phytonutrients. That’s a lot of nutritional heft for a member of the cabbage family. Teamed up with quinoa, an ancient grain and an amino acid-rich protein, these 2 ingredients form a powerhouse of nutrition, promoting health, clear breathing and anti-inflammation. More importantly, they taste great – especially when seasoned and tumbled with raisins, chick peas and carrots in a cumin-spiced lemon vinaigrette . The beauty of this salad is that its ingredients may be mixed and matched according to availability and taste. Fresh, raw spinach may be combined with or substituted for the blanched kale. If you don’t have quinoa in the pantry, then try bulgur or wheat berries. 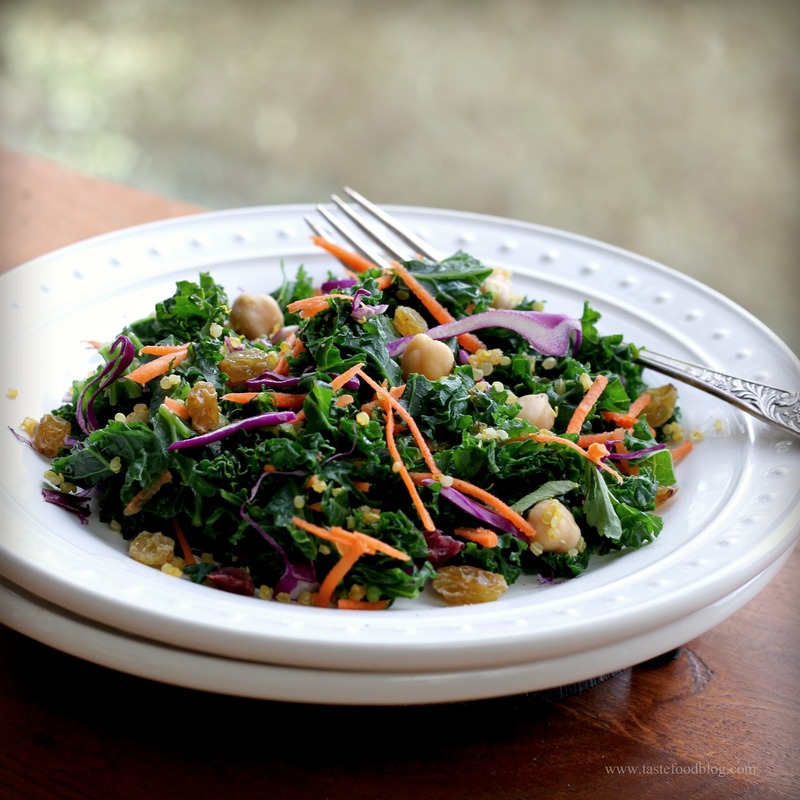 Almonds or walnuts are a delicious, nutrient-rich substitution for the chickpeas. Whisk together all of the ingredients except the olive oil in a small bowl. Add oil in a steady stream, constantly whisking to emulsify. Set aside. Remove the tough veins from the kale leaves. Tear leaves into large pieces. Bring a large pot of salted water to a rolling boil. Add the kale leaves. Blanch until bright green but not wilted, 10-15 seconds. Drain immediately and refresh under cold water or in a bowl of ice water. Spread in one layer on a kitchen towel and blot dry. Toss kale, carrots and red cabbage together in a large bowl. Add the chickpeas, raisins and half of the quinoa. Toss with half of the vinaigrette. Transfer to a serving platter or divide among serving plates. Sprinkle with additional quinoa. Drizzle with remaining dressing to taste. This post is the first in a series of monthly posts devoted to Cooking for Your Health. In coordination with my long-time friend, Knirke, who is a Swiss-based pilates instructor, this column will provide a monthly recipe designed to boost health in synchronization with the season and a particular health theme in Knirke’s monthly newsletter. This month, the theme is breathing. Clear and deep breathing is essential to our vitality and health, providing oxygen to our blood and brain. The foods we eat can promote or interfere with our breathing. Interfering food allergens may be wheat, dairy and red meat which produce mucus. To counter this, it’s important to eat plenty of fruit and vegetables throughout the winter. Colorful produce is a rich source of anti-oxidants and vitamins, reducing inflammation, fighting infections and boosting our immune system. And, not only are they healthy for you, they are delicious, too. So, don’t just relegate your winter vegetables to a recuperative diet – enjoy them daily! It’s the time of year when I like to take a culinary holiday in my kitchen. October is behind us, finished in a flourish of pumpkins and candy. Thanksgiving is looming, and thoughts are rife with turkey, stuffings, and pies. Before we know it we’ll be sipping gløgg and baking Christmas cookies, poring over recipes for roasts and trifles. At this time in early November there is a brief lull, lending a moment of quiet respite. During this time I crave recipes that are sturdy and exotic, influenced by traditions that are not associated with Hallmark greeting cards. It’s a window of reflection, healthy eating and escape. It’s also an opportunity to earn extra points in the diet category, so that we are fit and robust, ready to hit the ground running when the holidays are upon us.